It's rather odd to wake up to a whole different number. Last year was all about embracing a new decade (yikes! ), this year is all about jumping feet first into the flip side of forty. 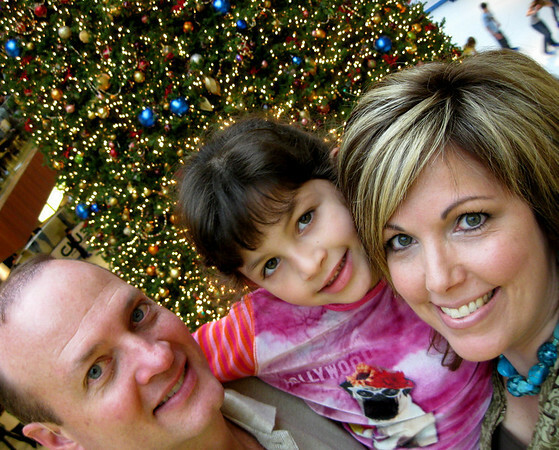 A family self-portrait as we did a little early celebrating at The Galleria Saturday. So far it's not too shabby. I don't feel any older. Although I did go bowling on Friday night and took a basic knitting class Saturday evening. Maybe a pair of SAS shoes and early bird buffets are just around the corner for me. they say the red hat does not fall far behind the SAS shoes. resist. RESIST!! Happiest of birthdays to my favorite 41 yr old. You make it look easy. Love you! The bowling and knitting are too funny in this context, but you redefine such stereotypes! Happy Birthday sweet friend! I hope you have a fabulous day. You deserve it. You are the most radiant 41-yr old I know...just look at you! That SKIN--seriously, girl. You glow. Happy Birthday! I hope I'm embracing each new year as peacefully as you seem to be. Also, I love bowling. And don't forget to hang those reading glasses around your neck on a chain. And you are still younger than me, missy! ha! Happy Birthday! Hope this year is a great one! and, yay!, for knitting. I'd like to learn too sometime...you'll have to share your experience. Forty one looks fabulous on you. Happy birthday, my friend! I just found your blog--happy birthday! You look marvelous you spring chicken. I actually tried on some of those SAS shoes the other day--blech! Glad you had fun!